Rusty Wagon Red Ale is sporting a new look. After many delays, Plan B’s newest beer is finally wearing a great-looking label. 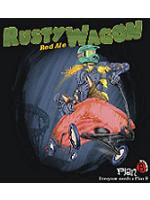 Rusty Wagon Red Ale is a delicious malty beer packed full of hoppy goodness. With the addition of this robust red, Plan B now regularly brews six beers. If you want to try all six, ask for the variety pack. Plan B is proud to announce a new, BC-based hops supplier. This year, Bitterbine Hop Farm in Lillooet, BC will supply Plan B with enough hops to keep Bulkley Valley beer-lovers in hop heaven. Bitterbine is currently in its second year of achieving official organic certification, so the first batch of hops will be produced under transitional status, but the following year’s harvest will be certified organic. These organically-grown hops pair nicely with organic malt supplied by Gambrinus Malting. With this addition, most of the ingredients in Plan B beers are now organic. To celebrate the new relationship with Bitterbine Hop Farm, Plan B brewed a fresh-hopped IPA. “Fresh-hopped” means the hops used to brew were thrown in the pot almost immediately after picking, still wet. Sam at Bitterbine picked the hops late one evening and the crop was driven up to Smithers and brewed with the next day. The result is a hoppy, citrus-flavoured thirst-quencher of an IPA. There is only one batch of this unique Plan B brew, so don't miss it!